Meet SHOCKWAFE, Nakamichi's reference series sound bar in a return to its original, high-end heritage. 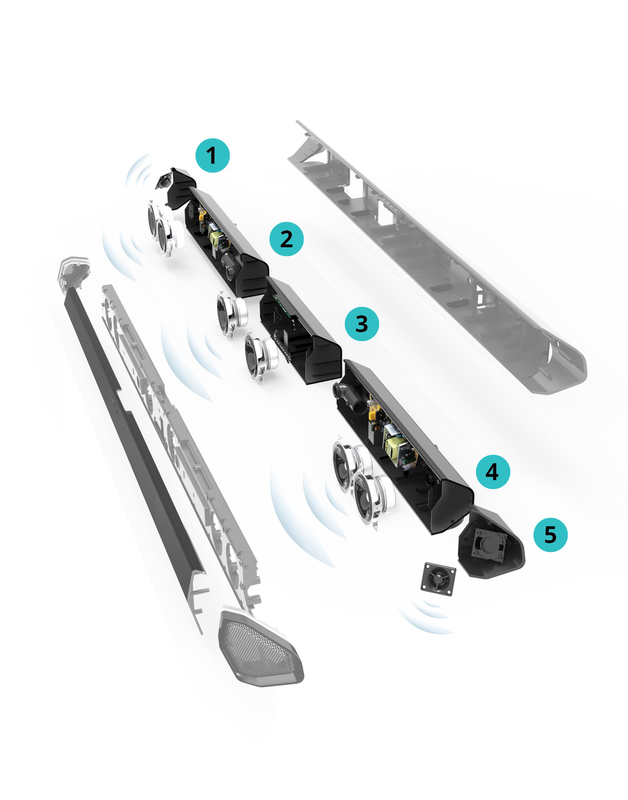 Pioneered with revolutionary Surround Effects Tweeters, SHOCKWAFE's 7.1 Channel sound bar offers the widest, life-like surround sound for an unparalleled theater experience. With over 60 years of audio expertise, we're literally making waves. SHOCKWAFE uses Dolby Audio and DTS Digital Surround technology to bring true dimension to your audio. 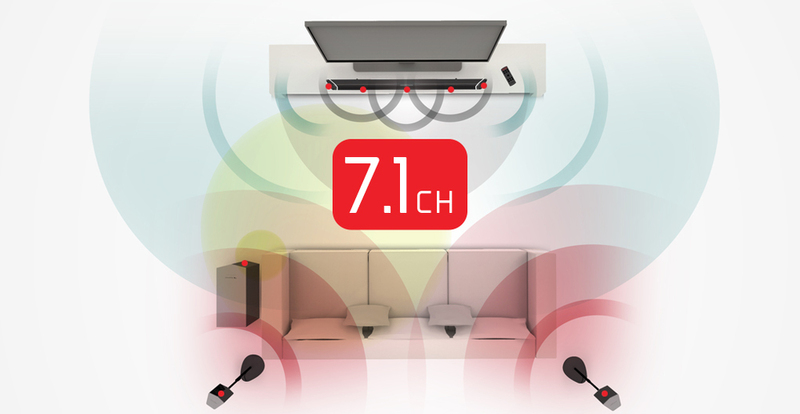 Our exclusive Effects Tweeters immerse your theater with ultra-wide 7.1 Ch surround sound. Enjoy true cinema sound in your own home with 10 speaker drivers + an 8" wireless subwoofer capable of hitting up to 104dB sound pressure level and 35Hz deep bass, respectively. Every aspect of SHOCKWAFE was designed with a purpose, from its sleek metallic accents to the backlit LCD learning remote. SHOCKWAFE'S surround is in a class of its own. Two exclusive Surround Effects tweeters enhance clarity and acoustic wideness, producing the most realistic and immersive sound stage to your home theater environment. 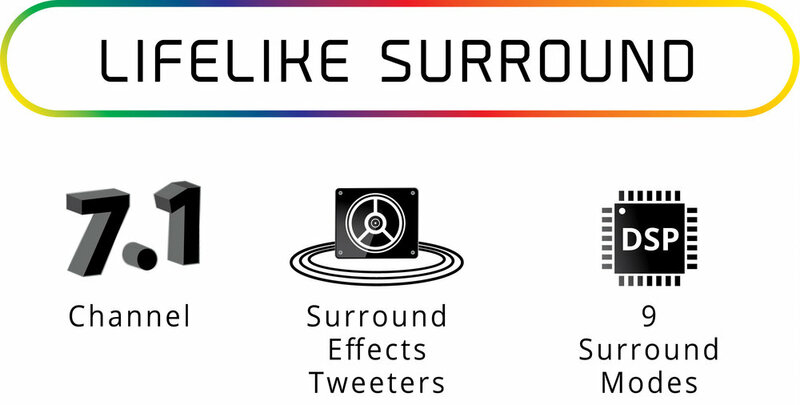 Surround Effects tweeters unlock next level surround performance by reflecting sound off walls, ceiling and floor. Radiating life-like sound directly to the audience. Distinguished premium construction featuring 5 individually sealed sound chambers to achieve a discrete audio configuration for each channel, dramatically expanding the immersiveness of your favorite movies and music. With 11 precisely tuned speaker drivers including a 8" wireless subwoofer and rear satellite speakers, SHOCKWAFE knows no boundaries with its immense power. When designing SHOCKWAFE, we only thought of you. 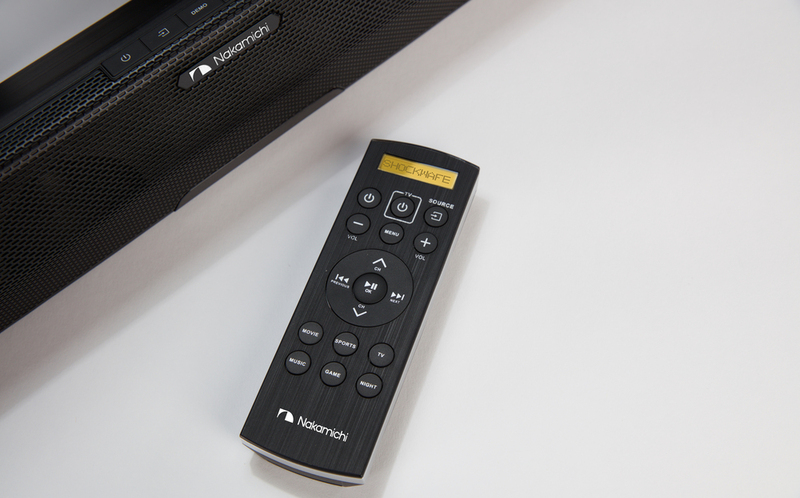 The end result is a stellar-looking sound bar with everything you need, engineered to deliver the true audio experience. Ideally sized for exceptional projection of sound. Your large HDTV needs flawless sound too. Complete audio and surround sound experience. Audio freedom. SHOCKWAFE comes with all connectivity options. The talisman to audio ecstacy. The remote that makes absolute sense. Night-friendly and intelligent, its functionality will amaze you. SHOCKWAFE comes with all connectivity options. You can even stream music from your device wirelessly. DTS, the Symbol, DTS-HD, and DTS or DTS-HD and the Symbol together are registered trademarks of DTS Inc., and all other DTS logos are trademarks of DTS, Inc.
Shockwafe Pro is rated at 104dB. The Sound Pressure Level is measured using pink noise at 1 meter, C-weighted. The Total harmonic Distortion calculated as an electrical measurement of amplifier distortion. Wireless Subwoofer is rated -3dB @ 35Hz. Nakamichi uses the industry standard LINEAR X SYSTEMS, LMS electroacoustic analyzer. The bass frequency is measured using swept sine wave at 2 meters, parallel to the subwoofer driver’s technique.